GO! and Green Light ®: Frequently Asked Questions. Term created to convey the magnitude of the impact of the Green Light® system: a quantum leap beyond a paradigm shift, Green Light improves everything. 2. Green Light action: powerful effective action aimed at creating the Ideal Scenario. 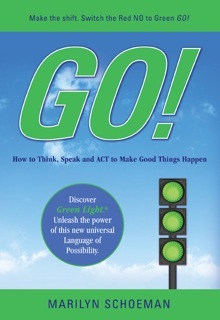 This is “Optimizing Psychology” – the Green Light® way to think, speak and act to make good things happen. It is consciously choosing empowering language and effective actions for the greatest good, generating happiness, compassion, fulfillment and joy. 4. What makes GO! different from all the other positive books? It introduces you to Green Light. Green Light goes far beyond platitudes of “just be positive”. It’s a specific language, a way of thinking and taking ACTION. 5. How would you define Green Light? Green Light is a conscious choice, a conscious intention to think, speak and ACT to make good things happen. It is a skill, a new universal language, a transformational tool, a mind technology, a way of life, a global movement. 6. What is the goal of Green Light? The Green Light goal is to create the greatest good, in the best way, for the most people, for the longest time. Achieve this goal by putting Green Light into action. Use the best (Greenest) words, ask the best (Greenest) questions, take the best (Greenest) actions to achieve the grandest (Greenest) success. 7. What are the benefits of Green Light? It provides a common language, a unifying force. It moves you beyond obstacles and toward objectives, producing greater results. In addition to the above, Green Light reduces stress and helps your body release positive, feel-good bio-chemicals. This improves brain health, brain function, confidence and well being. 8. Why is Green Light called the Language of Possibility? Green Light begins with the assumption YOU can make good things happen. This fosters a possibility mind set. A psychologically safe environment helps too. With Green Light, new possibilities arise – that weren’t possible with Red Light mindsets. It’s a great boost for creativity, productive risk-taking and innovation. 9. Green Light gives you a common language, a tool you can use for better communication and collaboration. Tell us about that. When you say, “Here’s a Red Light challenge.” or “We’ve got a 2 Red challenge. How do we Green it up?” That’s a quick effective way to state a situation and the goal. 10. What is the Green Light Scale? By using the traffic signal metaphor you identify WHERE YOU ARE AND WHERE YOU WANT TO BE. GREEN LIGHT HELPS YOU GET THERE. Using the Green Light Scale™ (see back cover) of three Red Lights to three Green ones, you can GO! from the worst case toward the Ideal Scenario. With this new awareness you can choose the Green actions that move you forward. 11. Green Light eliminates lots of negative interactions – avoiding finger pointing, blaming, scape-goating and other elements of conflict. Here’s how. It brings new accountability for behaviors. It communicates to everyone what’s acceptable and what’s not. It identifies unhealthy, counterproductive Red Light behaviors and healthy constructive Green Light behaviors. It provides an easy, clear guide for creating a supportive and productive environment. People love it and thrive in it. 12. Some people often gripe, complain and criticize. How do you get them to use Green Light? It’s a choice. It may need to be a request – or a requirement, if you’re in charge. Your use of Green Light can model and subtly train others. You might ask them, “What is a Greener way to approach this?” We all want the same thing –food, shelter, security and to be happy. Green Light supports that. Red Light doesn’t. 13. Green Light is referred to as a game. Please explain. Viewing Green Light as a game is a Green Light perspective. You’re more relaxed, have more fun, do better thinking, have better participation and produce better results. Nobody wants to be put on the spot when you ask what needs to be done differently. For example, you’re asking for ideas not assigning blame. It enrolls people and they keep getting better and better at it – because everyone wins. 14. How would I use Green Light in my business and in my personal life? When you have an important goal it’s very powerful to ask yourself what is a 3 Green Light solution, what is the Ideal Scenario? Just by asking that question you put your brain on fast forward and get new and better options and ideas for implementation. In a relationship you can sometimes give a Red Light response and damage your relationship. This helps you to choose Green Light responses that strengthen your relationship vs. break it down. 15. How have you used Green Light? One example relates to flying. I travel quite a bit. Sometimes flights get cancelled, which often means long lines of people at one agent. I go to agents at different counters, greet them, tell them my challenge and ask, “What’s the best way to rebook a flight?” Not only have I received quick help, I’ve learned additional strategies too. Another example is when I was speaking at a hotel and wanted one of their potted plants up on the stage. Instead of asking if I could do that, and being told that it couldn’t be done, I asked, “How soon could this be done?” The quick reply and result? Done in a couple of minutes.